Bianca Brunner’s practice is about photography and the image itself, always retaining the possibility of an indexical relationship between an image and its subject. 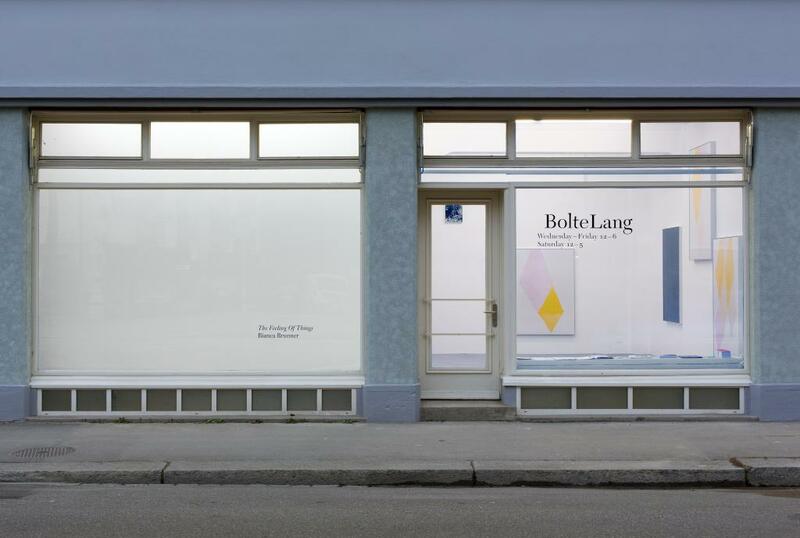 In her second solo exhibition at BolteLang, Brunner presents her two new photographic series Harlequin and Stick alongside two new pieces Night 1 and Night 2. These particular works explore the correspondence between photography and drawing/painting, and how the fleeting and fragmentary nature of drawing and painting can be communicated through the deliberate and ‘complete’ medium of photography. The bright colour shapes in Harlequin develop from sketches and are then constructed from fabric and suspended in her studio where they are photographed. Bianca Brunner’s intention is to create images in which the subjects are poised between three-dimensionality and flat ‘drawn’ forms. In contrast, the black and white Stick photographs are made en plein air, where a diagonal shaft of wood marks a rift across dense foliage and thus the picture. She is interested in the textural qualities of the image that results, but also in connecting this to the immense European landscape tradition in art and literature. The two large silver gelatine prints Night 1 and Night 2 show a forest scene at dusk – pitch black leaves and tree trunks are interspersed by flecks of light and the repeated sharpness of leaves is interrupted by blurred moments of movement. Despite their strong formal contrast to Harlequin these works share the same flat, drawing like or painterly, and ornamental qualities. These qualities are enhanced by the installative hanging in the gallery space – while the Harlequin seem to fly up the wall, the two Night works provide a calm anchor. The two are linked by the black and white Stick pieces with their mint green frames. Bianca Brunner was born 1974 in Chur and lives and works in Zurich. She received her Master of Photography from the Royal College of Art in London in 2007. Recent exhibitions include SOME / THINGS, Proyectos Monclova, Mexico, 2014; Docking Station, Aargauer Kunsthaus, Aarau, 2014; Twisted Sisters: Reimaging Urban Portraiture, San Francisco City Hall, 2014 and Museum Bärengasse, Zurich 2013, Uninhabitable Objects. Behausung zwischen Imagination und Realität, Bündner Kunstmuseum, Chur.